Cold Weather, Under the Weather?? 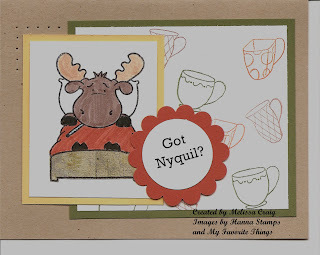 OK - I am totally in love with Riley... Riley Moose by Hanna Stamps, that is. So cute!! I made this card for a swap and I just think it's adorable. OK... so the whole Got Milk catch phrase is a bit over used, but it worked for me here. And who wouldn't want to give this little guy something to make him feel better!? I used Kraft card stock for my base, Always Artichoke for the next layer and with MFT's Thanks A Latte set, I stamped the mugs in coordinating colors. Really Rust is used for the scallop. I used a word program to create the sentiment and then punched it out. The Riley is colored with Close to Cocoa and Creamy Caramel. I used an old SU! dp that I can't remember it's name for the bed doing paper piecing. Layered him on So Saffron and did a little paper piercing to give it a bit of texture. I like it. I hope you do, too. Do you want to know the story behind my attraction to this moose? Yes! Oh good!! When my oldest son was little I gave him a stuffed Chris-Moose for Christmas. He unwrapped him and out of his sweet little mouth came "look at dat moose." It's become the thing to say when you want to get him to look the other way when you want to steal his ice cream or whatever. But the sweetest part of this whole story, that wonderful little boy is now 13 and every year when it's time to decorate for Christmas, he pulls his Moose out and he sits on his bed during the holiday season. Happy getting ready for Christmas to you. I hope you stay healthy!